It feels like only yesterday that I introduced you to the Blog Monster and was sharing some of her lovely recipes. And my Mom’s coming back tomorrow and I can’t wait! I thought that the best way to welcome her was with a freshly baked babka which I took from the Australian Gourmet Traveller April Issue. This babka is made with chocolate and a hazelnut paste and is one of the best brioche recipes I have tried so far. This is the second time I’ve made it and, I like the dough so much, I am thinking of using it as a base for other sweet (and savoury) creations! I’m thinking along the lines of Lemon and Orange, or maybe even Chorizo and Caramelized Onions, or Ham and Cheese?! The choice is endless so stay tuned! 1. Combine milk, yeast and 1 tbsp sugar in the bowl of an electric mixer fitted with a paddle and set aside in a warm place until foamy (5-7 minutes). Add 75gm flour, mix to combine, then add eggs, yolk, remaining sugar and a pinch of salt, mix to combine. While mixing on low speed, gradually add remaining flour until combined, then add 150gm butter, a little at a time, beating until dough is shiny and elastic (3-5 minutes; dough will be quite soft). Place dough in a lightly oiled bowl, cover with oiled plastic wrap and set aside until doubled in size (1-1½ hours). 2. Preheat oven to 180C. Place hazelnuts on a baking tray and roast until golden (5-7 minutes), cool slightly, then rub with a tea towel to remove skins and cool completely. Process in a food processor until coarse crumbs form, combine with remaining softened butter to form a paste and set aside at room temperature until required. 3. Knock back dough and divide into two. Working with one half at a time, roll dough on a lightly floured surface into a 20cm x 32cm rectangle. With longest side facing you, spread over half the hazelnut paste, leaving a 4cm-border, then scatter over half the chocolate. Roll away from you to form a cylinder, brush ends with a little eggwash, then join ends to make a loop, twist into a figure of eight and place in a 9cm x 19cm loaf tin lined with baking paper. Set aside in a warm place until dough reaches the top of tin (1 hour). Repeat with remaining dough. Brush babkas with eggwash, scatter with demerara sugar and bake in centre of oven until golden and cooked through (35-40 minutes). Cool in tins for 10 minutes, then turn out, cool on a wire rack and serve warm or at room temperature. Babkas will keep, stored in an airtight container, for 3 days, and are best served warm or in toasted slices. And before I let you go, like any proud mother who loves to share her children’s photos, here is one of the cutest pictures I took of my two dogs. One day I got out of the car and in went Baci, on the front seat, followed closely by Bizou, sitting right beside her. 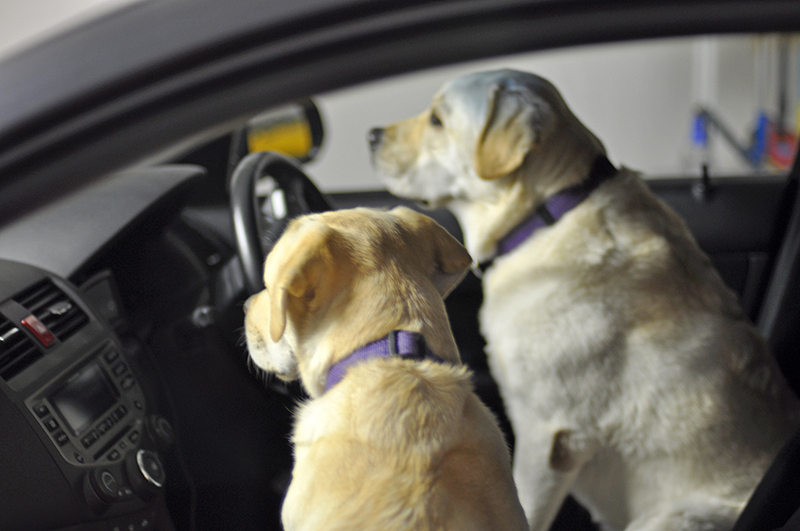 They absolutely refused to get out of the car (despite me bribing them with some treats!). I have a picture by my desk in the office and everyone who stops by comments on how cute they look (I know I know!). I stumbled upon your site in bing. And I’ll be back in the future, thanks. I definitely need to try that! 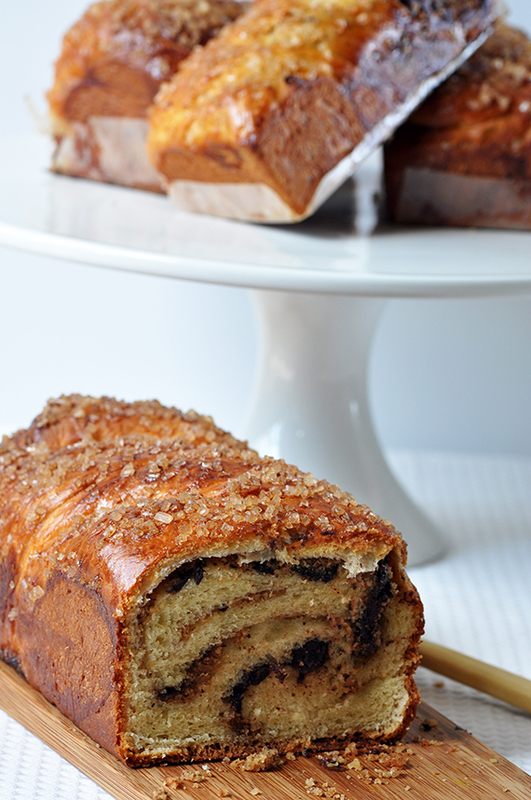 Your babka recipe looks marvelous! The pictures alone have me drooling! I just discovered the recipe (and your blog) today, and I want to make your babka tonight. In sharing your recipe with my sister-in-law, she had a question. She has a large jar of Nutella (chocolate-hazelnut spread) and wonders whether she could use it in place of the chocolate and hazelnuts called for in the recipe. If so, how much should she use? Thank you for your recipe and also for any adivce you might offer. Yes…. I m happy to be back n soon when Trissa is back I ll be doing some cooking. In fact, I ve already started by mo one to take the photos…. so guys let’s wait for her. Chocolate and hazelnut? There are few better sweet combinations in my opinion. And I love that you’re already thinking of spin-offs. Can’t wait to see what you come up with down the line :). Babka is one of my all time favourite things. I wish I could be sitting down with this! Welcome back to the Blog Monster!! 🙂 You sure made a lovely welcome treat and that picture of your dogs is just too cute!! Happy Easter Trissa! Lovely to meet you the other night and thank you for your visit and lovely comment on my blog! I saw this recipe in this month’s issue. I really wanted to try it over Easter – but I haven’t had a chance 😦 maybe later… yum! 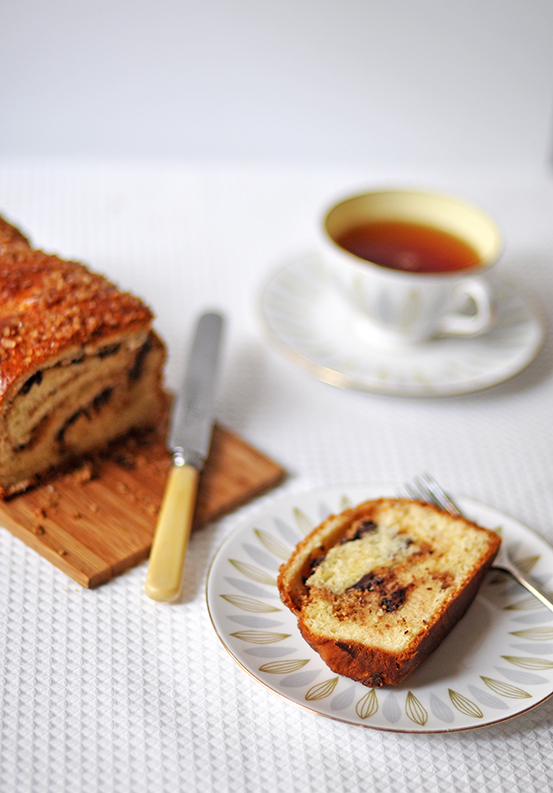 The babka looks great and what a way to welcome back the Blog Monster. Love the look of the sugar crust. Bet that would be so crunchy! Cute photo. Though I don’t know what they’re thinking, it looks very clear from the photo that they have no intention of leaving. Oh my gosh the babka looks to die for. The pups are adorable! That babka is to die for! I am bookmarking this now! What a fabulously tasty & awesome bread!! Happy easter to you & your family!!! 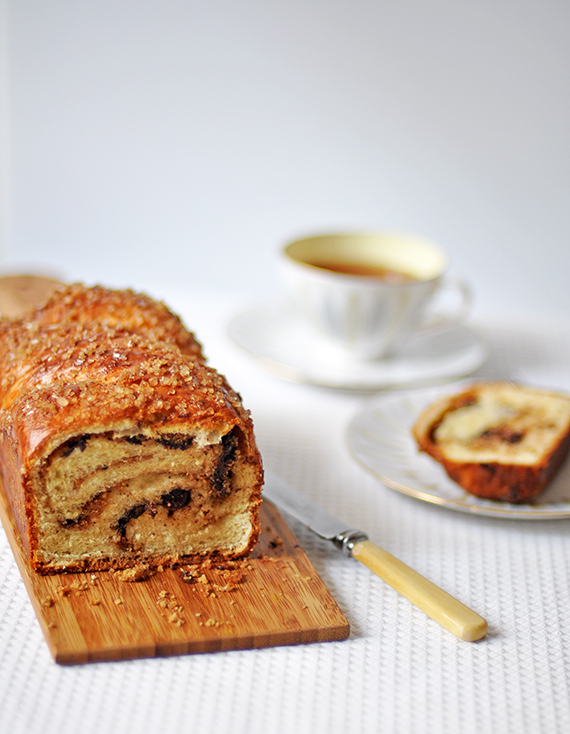 i love babka but have not made it for some time – looks amazing! Thank you for the brioche recipe. I have tried a couple and have not been happy with them. I will definitely give this one a whirl. That’s so wonderful to have your mom back. I wish my mom is here! This loaf looks really delicious. Love all those filling and the pattern it created. I can only imagine how delicious it is. And….your doggies are so adorable 😀 Happy Easter! Happy easter and welcome back to your mum! And those labs are beautiful. Beautiful recipe and love the other combination you’ve mentioned. I am just drooling right now. The dogs are saying… blog monster is back! They’re really adorable even if they’re not facing front. Oh the recipe looks so good. I have seen these at the deli and never bought them. Mmmmm yum! Umm babka, it’s been a while since I had some. And everytime I see photos, I fall more in love with Baci and Bizou! Awww. I looooooove Babka and yours looks especially delicious. I can almost taste the buttery bread with the crunchy sugar on top. Great photos! This was so yummy and I loved it toasted with some parmesan cheese! Happy Easter to you and your family! And happy blogging anniversary! Very very adorable Labs (I have Golden Retriever), Bizou and Baci are cute and perfect name for them! I never made Babka before, but I think I should think about making it one day. I am sure yours tasted wonderful! That is the most beautiful and delicious looking babka I’ve ever seen. And I love the fake conversation your dogs are having. so funny. Your babka looks delicious and I bet it is! Great treat at Easter time! Love your fur buddies! I like the way you shaped these babkas..! Hooray for the BM’s return (Welcome back Trissa’s mummy). And yay for that fab babka. Your dogs are sooo gorgeous. I’m not sure if I ever tasted babka. It looks delectable with the granulated sugar on top! Can’t wait for new stories with the Blog monster! Have a wonderful time with your mum. You dogs are super cute! 🙂 Happy Easter Trissa! i’m not exaggerating when i say that your loaves of babka are the most perfect i’ve ever seen. the crumb, the swirl, the filling–all heavenly! oh, and the dogs are adorable. I saw the babka on GT and now on your blog. Drooling…. Lovely babkas..and I saw dark chocolate again…gosh! It’s killing me….the temptation I mean! It reminds of the bread I’m eating right now (it has beans on it). This looks really good though! Would love love loveeeeeeee to try it, seriously! Love the topping! Of course, the babies are sooo cute! It makes me want to be a dog for a day, hehe. Wow, amazing. I adore babka. You don’t see it here in the UK. Last time i had it was about 2 years ago when I was in NY. Its just so good and so hard to put down–I had a cinnamon one. Yours look so fabulous. I want some! Babka..my babka! Looks delish Trissa! I’m sure your mother will love them. Enjoy your Easter break and that last pic is too funny! The Chocolate Babkas look delcious with a hot cup of tea. The blog monster is back. Yiheeeeeeee… I cant wait to see the next few post. What will you two be cooking next ehehehe. It reminds me of cinnamon – raisin bread. This looks great. I hope to try it soon. My husband just looked at your gorgeous pictures of the babkas and said, “Ooh what’s that? That looks goooood! !” which is him hinting that I should save this recipe and make it for him. 🙂 Looks so great! Yum! This looks like a fantastic treat for Easter! I love the swirl! and the crust looks amazing! nawww your dogs are so cute hehe happy easter trissa! That’s a gorgeous Babka (and Bizou and Baci, haha!). You really must make it with chorizo and onions, too – yum! The babkas looks phenom, esp encrusted with brown sugar crystals. And oh, Baci and Bizou … what lovely names! Kiss Kiss. 🙂 They are beautiful! Great recipe! I’ve been wanting a good brioche recipe for a while now. With your recommendation I know this is it.